The capital letters above are the bead key identifiers, which are referenced throughout the instructions. Work the flower base in A, (Fig. 1). When all the five rows are completed, do not cut off. 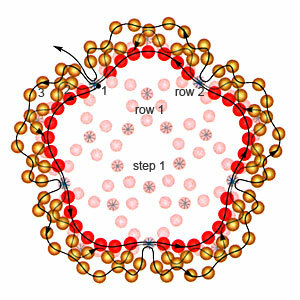 Instead, go through any bead of the basic row marked (*) to get into position to work the petals. 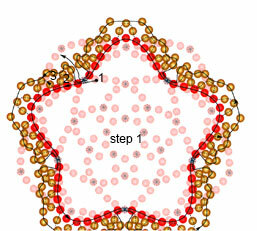 Using A, B work the inner petals (Fig. 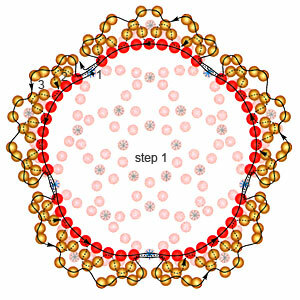 2), going through (*) beads of the basic row, then of the first and the second rows. Make four petals on the basic row beads; five petals on the 1st row beads of and five more petals on the 2nd row beads. Work the outer petals in A, B (Fig. 3), going through (*) beads of the 3rd and the 4th rows. Now bead the 2nd and the 3rd rows of Fig. 3 atop of the 5th row of Fig. 1. Work the flower base in A (Fig. 1) similar to what you have done before, but beading four rows instead of five. Fix the thread but do not cut off. 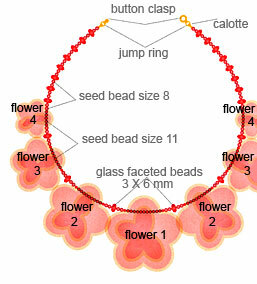 Instead, go through any bead of the basic row marked (*) to get into position to work the petals. Work the inner petals in A, B (Fig. 4), going through (*) beads of the basic row, then of the first and the second rows. 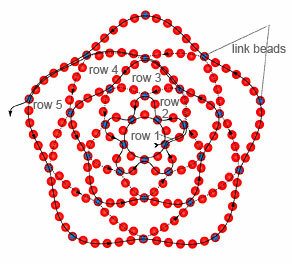 Make three petals on the basic row beads; five petals on the 1st row beads; five petals on the 1st row beads of and five more petals on the 2nd row beads. Work the outer petals in A, B (Fig. 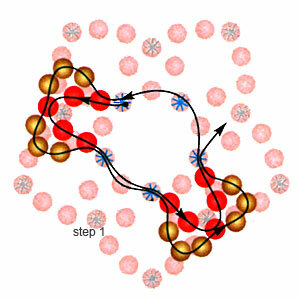 5), going through (*) beads of the third row. Now bead the 2nd and the 3rd rows of Fig. 3 atop of the 4th row of Fig. 1. Work one more flower in the same way. Work the flower base in A, (Fig. 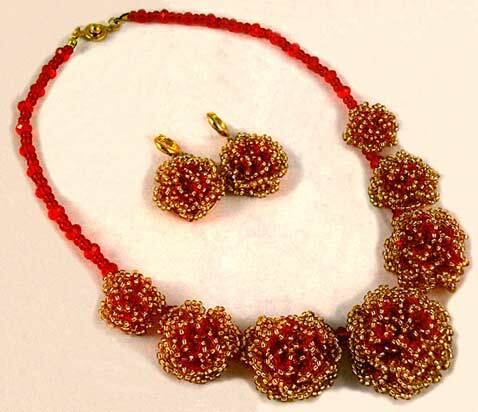 1) similar to Flowers 1 and 2 but beading only three rows. Fix the thread but do not cut off. 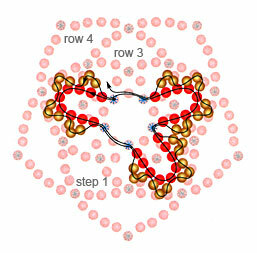 Instead, go through any bead of the basic row marked (*) to get into position to work the petals. Work the inner petals in A, B (Fig. 6), going through (*) beads of the basic row and of the 1st row. Make three petals on the basic row beads and 5 petals on the 1st row beads. Work the outer petals in A, B (Fig. 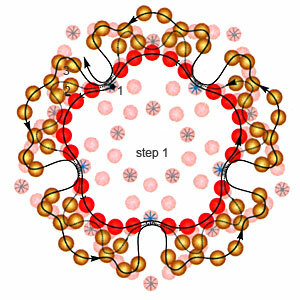 7), going through (*) beads of the second row. Now bead the 2nd and the 3rd rows of Fig. 7 atop of the 3rd of Fig. 1. Work one more flower in the same way. Work the flower base in A (Fig. 1) similar to Flowers 1 and 2 but beading only three rows. Fix the thread but do not cut off. 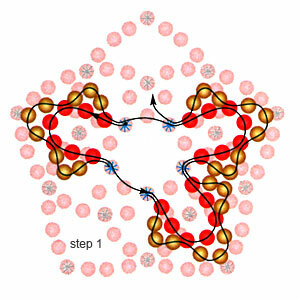 Instead, go through any bead of the basic row marked (*) to get into position to work the petals. Work the inner petals in A, B (Fig. 8), going through (*) beads of the basic row and of the 1st row. Make two petals on the basic row beads and five petals on the 1st row beads. Work the outer petals in A, B (Fig. 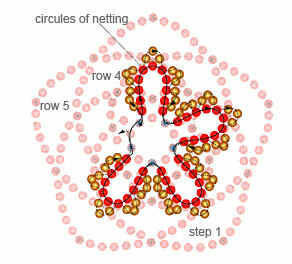 9), going through (*) beads of the second row. Connect all the elements by C and D beads (Fig. 10). Work two flower #3. Attach the flowers to the leverback earring findings.